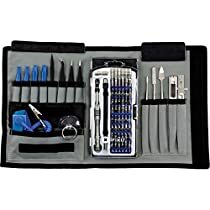 The original Pro Tech Toolkit, designed by iFixit using the tool data from the thousands of free repair manuals on iFixit. Contained in a sleek grey tool roll, the Pro Tech Toolkit will go with you to repair whatever you need. The Pro Tech Toolkit will have you fixing devices that are not even broken, just to use the cool tools. Dimensions: 2.5" x 5" x 10"